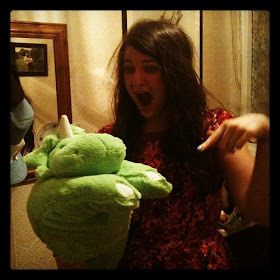 t*rexes and tiaras: Another heart calls.. 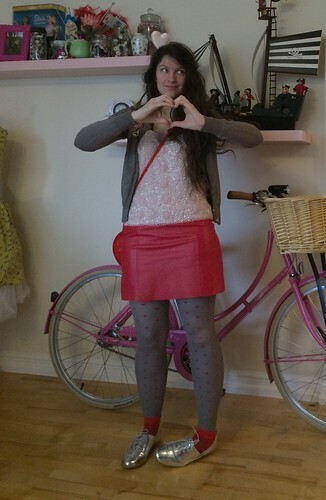 I decided I'd try to create a Valentine's themed outfit instead, and so dug out as many heart-shaped accessories as I could find. Let's face it, I've always been the kind of person to wear my heart on my sleeve, so why not extend that to my tights as well? 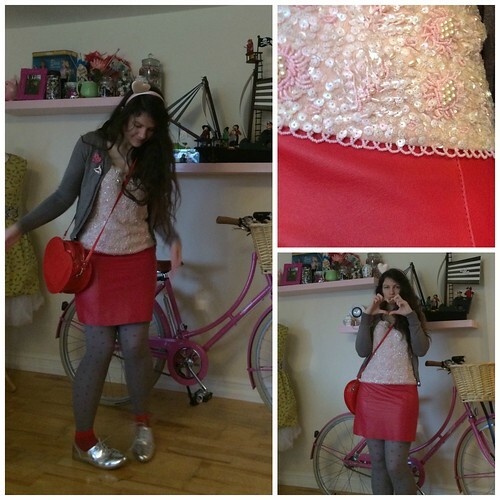 So, my thoughts on the skirt? Well, it's a little shorter than I'd usually be comfortable with in an A-line shape. It's a rather fab pillar-box red colour, it's great quality and the leather really is lovely; a buttery soft finish. I'm just not sure how much it really suits my shape, but that's more to do with my body shape than anything else! 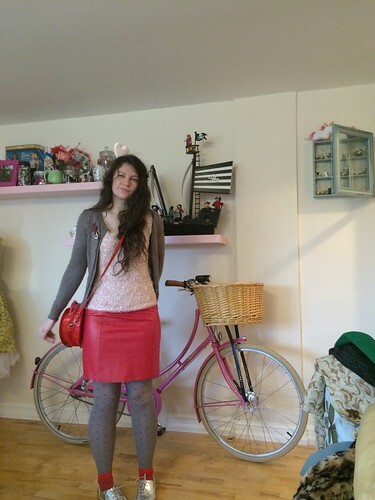 I loved the idea of mixing hearts and textures so decided to wear it with a pink beaded top I picked up from a vintage shop in Liverpool when I went to see the giants last year. I've not had a lot of wear from it since then, but like it with this - despite the fact that it means I'm breaking one the only 'dressing room rules' I was told when I was younger: pink and red clash. Sorry, Mother. 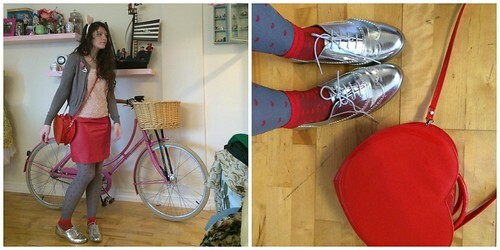 To continue embracing the clashfest, I added a red heart handbag and socks over some heart print tights and a pair of shiny silver brogues which I'd not yet had a chance to wear. 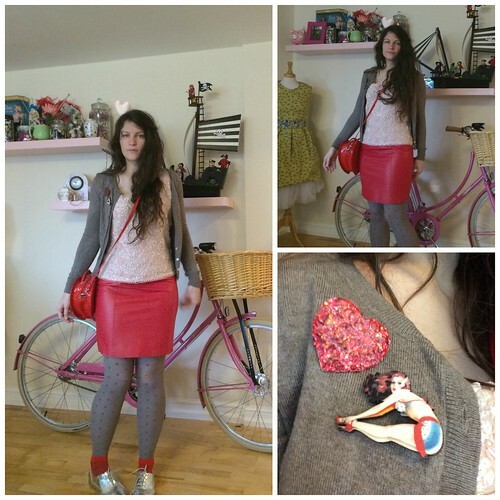 As a finishing touch, this heart headband and some brooches - particularly love this little pin up lady! 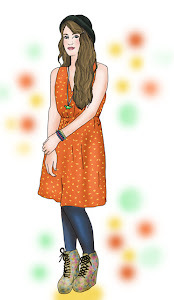 Ah loving this outfit on you Char! The skirt looks gorgeous! 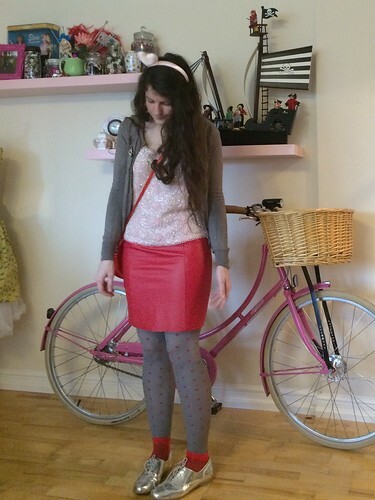 I'm not brave enough to wear a leather skirt! This looks lovely., great combo! I've got a few leather pencil skirts, which I'm fine with. This one. being that little bit shorter, for some reason made me much more uneasy. Mwah! Love the heart shaped bag Char. Thansk, I love that bag! It really is - you can fit all of the essentials in there. I'm quite liiking tights and socks! Thank you - I'm still not convinced about the shape, though.